Edvard Isto's painting Attack (1899) symbolizes the beginning Finland's Russification. 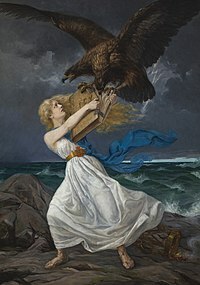 The two-headed eagle of Russia is tearing away the law book from the Finnish Maiden's arms. The policy of Russification of Finland (Finnish: sortokaudet/sortovuodet - times/years of oppression) was a governmental policy of the Russian Empire aimed at limiting the special status of the Grand Duchy of Finland and possibly the termination of its political autonomy and cultural uniqueness in 1899–1905 and in 1908–1917. It was a part of a larger policy of Russification pursued by late 19th–early 20th century Russian governments which tried to abolish cultural and administrative autonomy of non-Russian minorities within the empire. The two Russification campaigns evoked widespread Finnish resistance, starting with petitions and escalating to strikes, passive resistance (including draft resistance) and eventually active resistance. Finnish opposition to Russification was one of the main factors that ultimately led to Finland's declaration of independence in 1917. "Providence having placed us in possession of the Grand Duchy of Finland, we have desired by the present act to confirm and ratify the religion and the fundamental laws of the land, as well as the privileges and rights which each class in the said Grand Duchy in particular, and all the inhabitants in general, be their position high or low, have hitherto enjoyed according to the constitution. We promise to maintain all these benefits and laws firm and unshaken in their full force." This promise was maintained; indeed, Alexander II amplified the powers of the Finnish diet in 1869. Having enjoyed prosperity and control over their own affairs, and having remained loyal subjects for nearly a century, the manifesto which Nicholas II issued on 15 February 1899 was cause for Finnish despair. The manifesto was forced through the Finnish senate by the deciding vote of the senate president, an appointee of the tsar—and after the governor-general of Finland, Nikolay Bobrikov, had threatened a military invasion and siege. While ostensibly affirming the Finns' rights in purely local matters, the manifesto asserted the authority of the state in any and all matters which could be considered to "come within the scope of the general legislation of the empire." As a response to the manifesto, a petition with 523,000 names was gathered and a delegation of 500 people were sent to deliver it to the tsar. A separate petition called Pro Finlandia that contained the names of 1,050 prominent foreign people was also gathered few months later. the Finnish army was made subject to Russian rules of military service. The Language Manifesto of 1900, a decree by Nicholas II which made Russian the language of administration of Finland (in 1900, there were an estimated 8,000 Russians in all of Finland, of a population of 2,700,000)—the Finns saw this as placing the Russian minority in charge. The conscription law, signed by Nicholas II in July 1901 incorporating the Finnish army into the imperial army and forcing Finns to serve in Russian units. Finnish stamps were abolished and Russian stamps became the only allowed in January 1901. Some Finnish government offices, such as the Railway and Lighthouse Boards got new, Russian staff. From April 1903 until the Russian Revolution of 1905, the governor-general was granted dictatorial powers. Bobrikov used these powers by personally abolishing several newspapers and deporting notable Finnish political leaders. In June 1904 Eugen Schauman assassinated Bobrikov, the incumbent. The imperial government responded with a purge of opponents of Russification within the Finnish administration and more stringent censorship. However the passive resistance campaign also had some successes, notably a de facto reversal of the new conscription law. The Russification campaign was suspended and partially reversed in 1905–07 during a period of civil unrest throughout the Russian empire following Russian defeats in the Russo-Japanese War. The program was reintroduced in 1908 on, costing Finland much of its autonomy and again causing further Finnish resistance, including the Jäger movement. During 1909–1917 the Finnish politicians in the Senate of Finland were replaced by Finnish-born officers of the Russian army who were formally subjects of the Grand Duchy, creating the so-called admiral-senate or saber-senate. Russia demanded higher payments for not conscripting Finns (issue of sotilasmiljoonat, "Military millions"). The 1910 "Law of all-Empire legislation procedures" removed most of Finnish legislation from the newly established Finnish Parliament to the Russian Duma and State Council. In 1912 they passed the "Law of equality" which opened all Finnish government and civil service offices to Russians. Many measures were again suspended in 1914–17 during the First World War, but secret government documents published in the Finnish press in November 1914 suggested that the imperial government still harbored plans for the complete Russification of Finland. The second wave halted due to the February Revolution in Russia. During the Russo–Japanese War with the financial aid from Japan the rebels bought a shipment of thousands of rifles with the aim of creating an uprising and forming an independent state. However, the ship was wrecked off the coast of Finland and the plan fell apart. During the First World War when Russia and Japan were allies fighting against Germany, the Japanese handed to the Russian government a list of the leading men in the freedom movement (now in World War I working with Imperial Germany). ^ "1899. The Collection of Decrees of the Grand Duchy of Finland. No 3". Retrieved 2017-12-09. ^ "Pro Finlandia". Retrieved 2017-12-09. ^ Markku Tyynilä. "Historiaa: Amiraalisenaatin oikeusosasto". Retrieved 2017-12-08. Thaden, Edward C. Russification in the Baltic Provinces and Finland (1981).